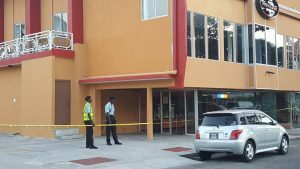 An area outside Club Privilege at Tower Suites hotel was Monday declared a crime scene, cordoned off and secured by armed police. Two employees of Tower Suites have been arrested as police continue to probe a shooting incident there early Sunday morning, raising the possibility of Club Privilege being closed by authorities. Police Commissioner, Seelall Persaud told Demerara Waves Online News that investigators were analysing surveillance video footage as part of their probe into the incident. Persaud said two technicians “suspected of tampering with evidence in the recordings are in custody.” Sleuths have already taken a statement from at least one person who claimed to be an eyewitness. Other police sources said a man was injured slightly by a gunshot during the fracas that allegedly occurred outside the Main Street-based hotel and night club. The incident on Tuesday continued to anger Public Security Minister, Khemraj Ramjattan who again suggested that Club Privilege could face closure. “When they cover it up like that, that is unacceptable. They are supposed to report it and all of that so we could know where incidents are happening and also to know what consequential action could be taken. Licenses of that nature, in my book, should be seized and then you compound the offence by covering it up,” he said. The Public Security Minister said he was awaiting details from the police. Investigators believed that efforts were made to keep the incident under the lid removing spent shells from the scene and failing to report it to police. The Police Commissioner said legal advice would be sought after the investigation is completed.